A storm surge is one of the biggest dangers along the coast when a hurricane, tropical storm, or other serious sea storm makes landfall. While many people think wind damage is the most serious impact of severe weather such as hurricanes, it’s often the case that coastal storm surge flooding leads to the greatest loss of life and property. 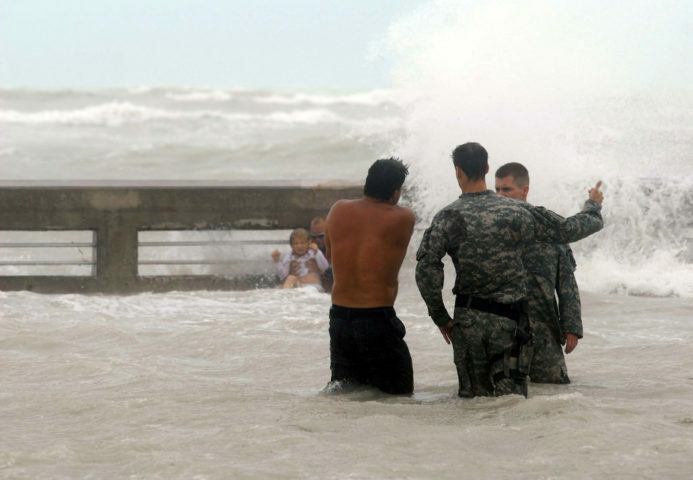 But what exactly is a storm surge? Why are storm surges so bad? And how can you stay safe from floods and rising waters during a hurricane or other tropical storm event? Remember the damage Hurricane Katrina caused in New Orleans? Most of it wasn’t wind damage. Rather, it was flooding, and much of it was caused by the surge of water that swelled along the coastline. The storm surge flooded parishes all around Lake Pontchartrain. Many of the 1,500 deaths caused by Hurricane Katrina are linked to the storm surged that ravaged the New Orleans area. A storm surge is like a wall of water that slams against the shore, flooding all nearby low-lying areas. Storm surges cause rampage across several miles, and they are capable of submerging entire cities under several feet of water. This is just one reason why coastal towns are terribly dangerous places to be when a hurricane or tropical storm makes landfall. Another problem that storm surges pose is that they don’t always settle back and drain away quickly. If the flooding engulfs a low-lying region set within a topographic bowl (such as is the case with New Orleans), the water can sit in the affected area for days, even weeks, at a time before draining or evaporating. When the flood waters wash in, people can become trapped in their homes, buildings can suffer irreparable damage to foundations and walls, and emergency crews may be unable to respond to calls due to impassible streets and highways. Did You Know?… Only 6 inches of fast-moving flood water can push over an adult, and 2 feet of rushing water can carry away vehicles. 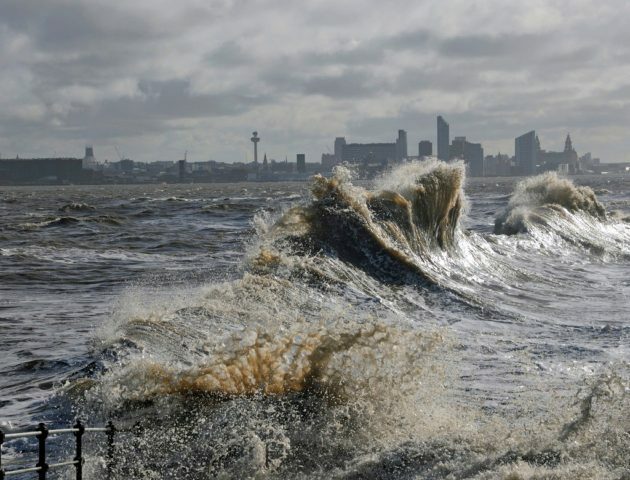 It’s possible that as climate change causes sea levels to rise, the adverse effects of storm surges may increase as water levels lick ever closer the shores of major coastal cities. What Exactly Is A Storm Surge? A storm surge is the bulge of water that rises under a hurricane or tropical storm due to lower atmospheric pressure and strong winds within the storm system. A storm surge is the abnormal rise of the sea level above the predicted astronomical tide that would usually occur. A storm tide is the amount of water above mean sea level, including astronomical tide and storm surge. It’s important to remember that storm surges are in no way related to tsunamis — which are long, high waves caused by events such as earthquakes and landslides. What Determines The Size & Magnitude Of A Storm Surge? Perhaps the most significant factor influencing the magnitude of a storm surge is the atmospheric pressure within the weather system. The lower a storm’s barometric pressure, generally the more intense the storm will be and the higher the storm surge. Stronger storms mean higher storm surges. A storm surges can be very dangerous, but there are ways to protect yourself from hurricane flood waters. #1 – Have a preparedness plan — Before a hurricane hits, you should have a personal storm safety plan for you and your loved ones. This includes stocking up on supplies — such bottled water, batteries, battery-operated radios and flashlights, non-perishable food, and toiletries. 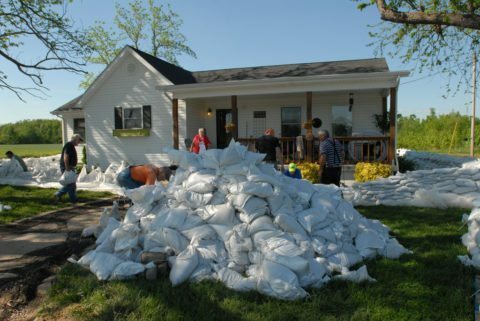 #2 – Protect your home against flood water — For example, place sandbags near all ground-level openings around your house, and secure all yard furnishings that may float away in a flood. #3 – Know your hurricane evacuation route — Long before the storm hits, be sure you know the nearest routes for evacuating to higher, drier ground. #4 – Know where your nearest hurricane shelter is — Refer to your local emergency management resources to find out where the nearest storm shelters are in your community. #5 – Stay tuned to the local news — The best way to know what’s happening during a hurricane or tropical storm is to keep in touch with TV, radio, and internet media for the latest weather forecasts, storm updates, and advisories.